Free Parking. Unobstructed on site parking for one car per room. The John Randall House is a large Victorian-style home presiding over the very center of Provincetown. Three blocks and five minutes from McMillan Pier and only one block from Commercial Street, we are literally moments from restaurants, clubs, boutiques, and amazing galleries featuring world-class art — and quite often, the artists themselves! We offer ten smoke-free guest rooms, each unique in design and appointment, each featuring its own dramatic works of art. 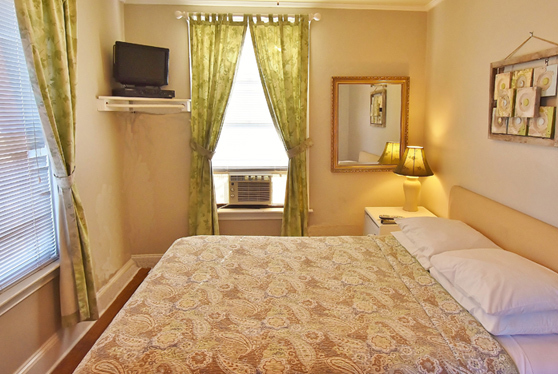 Every room is furnished with a Queen bed (maximum occupancy of 2 people), flat screen TV with full cable service, a guest refrigerator, and a clock radio. 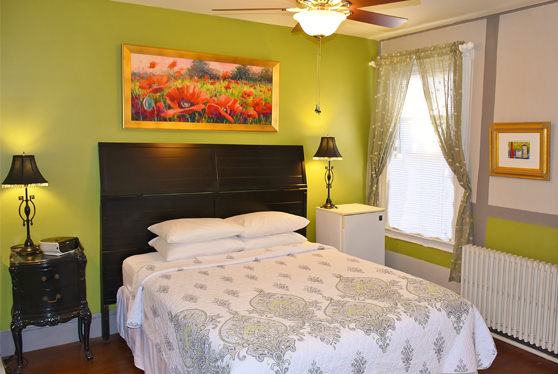 All rooms are now air conditioned and those on the first and second floor have ceiling fans. Several rooms offer private baths for guests who prefer en-suite accommodations, and complimentary WiFi is available throughout the house. Our breakfast bistro on the first floor provides a quiet place to enjoy your morning meal or a leisurely cup of coffee or tea throughout the day. The enclosed front porch offers another art-filled space for relaxing, reading, or just watching Provincetown go by. If you prefer to sit or relax outside, two separate decks adjoin the house. The John Randall House. Breathe, Relax, Enjoy. 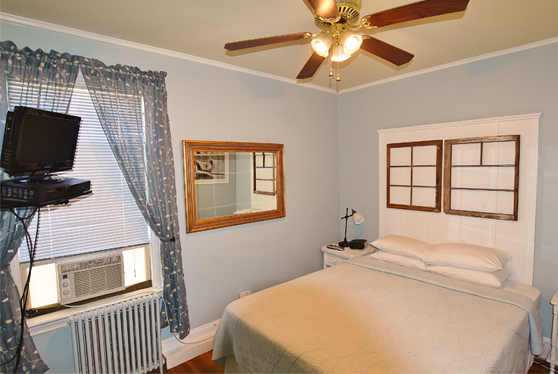 Our largest room, with hardwood floors and a tiled private bath with a full-size tub and shower. 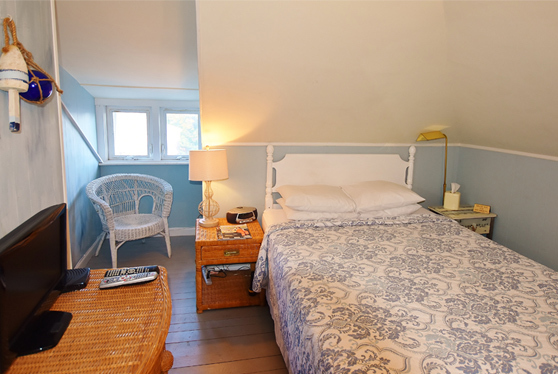 Truly a relaxing space for two and is painted in Yarmouth Blue and Lancaster white wash which continues the feeling of the cape when you peer out of the window toward the Pilgrim Monument. 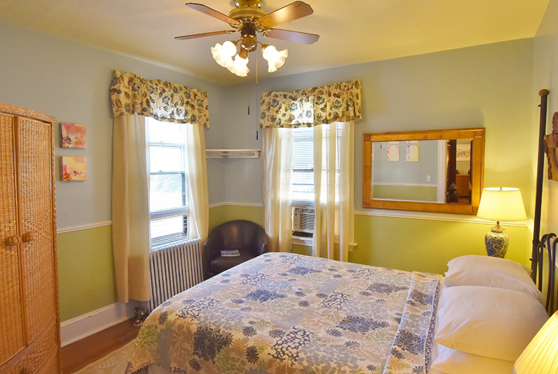 Located on the first floor, this room features a newly renovated private bath and a fresh update of colors. 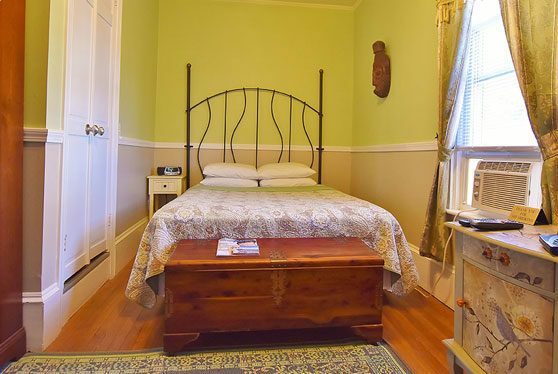 Take advantage of lying on the wrought iron queen bed and or enjoying your favorite book in the serene reading area. Evoking the feel of a Captain’s private quarters, the custom headboard and art remind you that you have landed in one of America’s first shipping ports. A captain’s quarters would not be complete without your own personal shower and shave area. 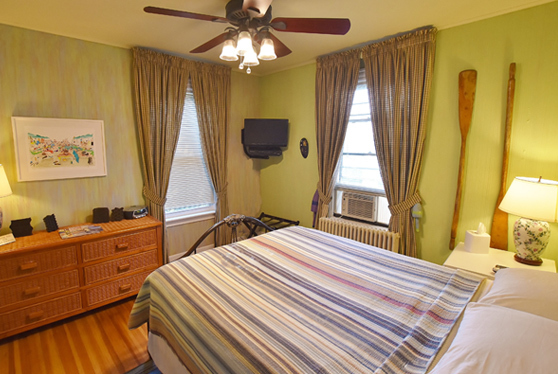 A bright, corner location on the second floor with a private bath. Begin your vacation by pulling back the sheers on the two large windows and deciding between shopping on Commercial Street or grabbing a cold drink and fresh salad at Far Land. Located on the second floor this bedroom was recently finished in light blue tones and Venetian plaster accent wall. Your window overlooks the side patio that faces the morning sun. This room is a beautiful corner unit with the inspiration for decor coming from the ornate antique wood headboard displayed. Enjoy your sunny and tranquil room near the back of the house. This naturally lit room exudes peacefulness. With hand painted furniture and a recently commissioned assemblage above the headboard. Relax in your own private artist’s studio. 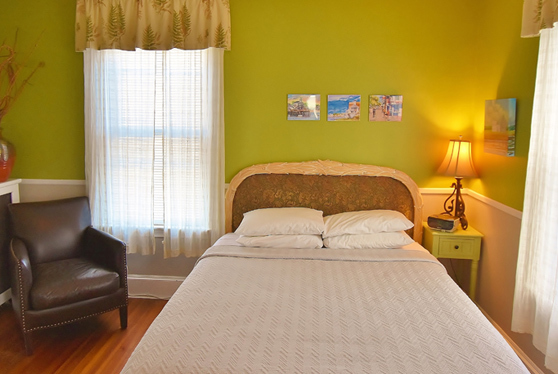 Located at the front corner of the house, Room 10 offers a view of the center of town with the harbor visible beyond, and can sleep two comfortably with a Queen bed. 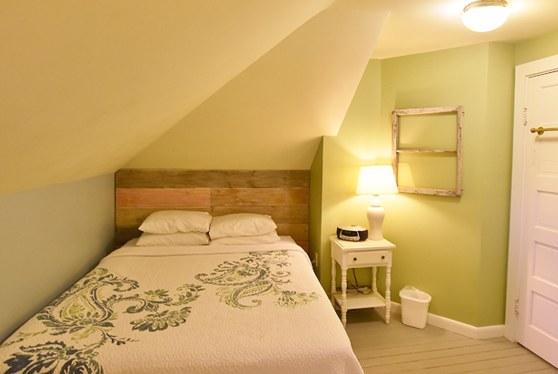 Finished in a cool green, and with its position on the third floor, offers a relaxing view of the Provincetown Monument and harbor beyond. © The John Randall House, 2019. All rights reserved.